And they're off: The starting line of the Mayo AC summer series in Swinford. Ballyhaunis was the venue for the second race in Mayo AC 2018 Vodafone C&C Cellular 5k Series which took place on the evening of Tuesday evening. Race HQ was at the Rugby Club with excellent warm up/warm down facilities around the adjacent pitch. It was a very warm evening for running with the tempratures clocking in at 22C° as the race started – a factor which had a bearing on the finishing times of many. Thankfully everybody got around safely. Brendan Conway was the clear winner in 16:48 – another success for Westport AC after clubmate Shawn McLaughlin’s win in Foxford. Adrian Smith (Roscommon Harriers ) was over a minute behind in second 18:06, Brendan Hession of Mayo AC holding on for third 18:38. Fiona Kelly (Ballina AC ) who finished fourth last week in the first series race at Foxford (22:19 ) was first woman home in 21:50 chased all the way by another fine run by Lynda Hession (third last week ) who finished just eight seconds behind, with Paula Donnellan third in 22:17 - both Mayo AC. Results: full results of all finishers are at www.mayoac.com Well done to the Ballyhaunis organisers who ran a smooth operation. They were led by Martin Fitzmaurice, with excellent local support from Meet &Train group, stewards, plus Mayo AC and Order of Malta (Knock. Also taking place this week was the Clarinbridge 5k, sixth and final race Galway Series. Two Mayo AC runners members were in action again this week. Well done Tony O’Malley who ran 18:51, and Keith Holland finished in 21:28. Regina Casey rounded off a fine series with a sixth place finish overall in a field of 600, and first woman in 17:44. 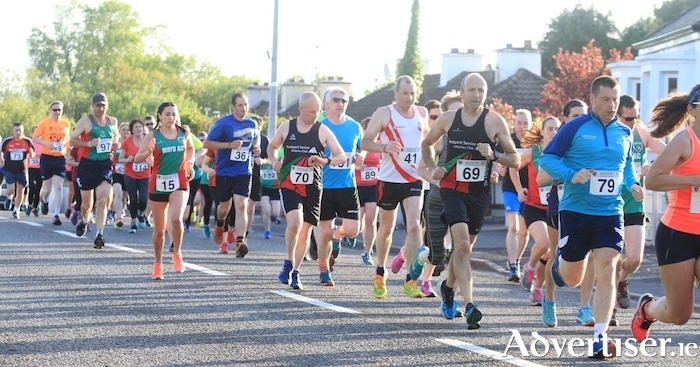 Running conditions were ideal as the first race in the ninth annual Mayo AC 2018 Vodafone C&C Cellular 5k Series got under way in Foxford last week. The 5km course was mainly flat with a straight run in to the finish beside the River Moy and there were many fast times and personal bests in the field of 131 finishers. Shawn McLaughlin (Westport AC ) was first over the line in 15:56, one second faster than his second place in the race last year. In a close finish he was chased all the way home by John Courell (Ballina AC ) who dipped on the line for 15:59. Kevin Maye (Moy Valley AC ) was third in 16:25. Brendan Hession was the first home of a large Mayo AC turnout in sixth place overall 18:04. Colette Tuohy (Mayo AC ) recovered well from her third place finish in the recent River Moy Half Marathon to win the women’s race in 19:19. She was over half a minute ahead of Serena Tuffy (Ballina AC ) second in 19:52. There was a close race for third between two fast improving Mayo AC runners with Lynda Hession just edging out Paula Donnellan by one second in 21:36. The River Moy Half Marathon race winner was Alan O’Shea (Bantry AC ) in 68:39 – beating his own course record. He won this race 2016 and was second last year. John Byrne (Mayo AC ) had a great run to finish third in 74:15 behind Michael Canty (Moy Valley AC ) 72:32. The women’s race was won by Heather Foley in 85:49. Sinéad Whitelaw (Mullingar Harriers AC ), recent runner up in the West of Ireland Women’s 10k, was second in 87:32, followed home by Colette Tuohy (Mayo AC ) – another excellent finish in 89:45. A few weeks ago two Mayo AC runners completed the Liverpool Half Marathon. Padraic McVann finished in 1:34.37, and Angela McVann came home in 1:50.35 – excellent performances by both. There was more Mayo AC interest in the recent Galway 5k series with Tony O'Malley and Keith Holland putting in strong runs in Athenry. Tony finished in a time of 18.25 and Keith Holland came home in 21.22 - their best times of the series to date.